‘If only her wings had been clipped’ is a phrase I see pretty frequently on social media, and it makes me cringe. Not just because it usually accompanies a terrible story about budgie in-home flight injury or death, but also because in many cases the injury was entirely preventable. There are dangers that are immediately fixable, like turning off ceiling fans or any fan without a blade guard, also turning off any exposed heating elements like stove tops. Close the lid of your toilet and take away glasses of liquid. Budgies can and have been killed by all of these things. Next step, if you have windows that could have windows without screens that you plan to open, EVER, install screens. When installed on the interior this will help your budgie not hit the glass, and even if they are exterior it will ensure that on hot summer days, or when airing out, you don’t lose your budgie out a window. You do not need to have a professional come and install expensive custom screens, you can make them from kits that are easily procured, such as this one: Prime-Line Products Screen Frame Kit (don’t forget to get the Window Screen ). In the above picture you can see the right panel of the window has a screen that was made from that type of kit. Also the left panel has a stained glass window covering it, which the parakeets can tell is something they cannot fly through. On windows that don’t open and therefore would not need screens you can invest in some inexpensive window clings that fit your decor, or the season. I have snowflakes on one window and ducks on the other and they have, without question, saved my budgies from head trauma or broken necks on countless occasions. Here are some decal options, Nature Window Clings or Sunflower Floral Removable Mural for Window . Another tip for windows is to install curtains or blinds. If your budgies are out after dusk it is best to completely cover the windows. A dark, black window can be even more dangerous and enticing than one in daytime. There’s a story floating around about a budgie named Boo who hit a window at night and lost the use of her legs – it’s a touching story that’s frequently used as a cautionary tale about full flight in the home, but I think we miss the point and it should be used to educate new budgie owners about the importance of covering windows. Mirrors can also be a big issue for budgies, Toby learned early on that they were not going to magically turn into portals, but Kelly has struggled with the concept. I could have used some more pretty decals here, but one day I just decided to slap on some ScotchBlue Painter’s Tape – it’s not the most elegant solution, but it works. You can do all this and still have issues, I’m sure there are things I didn’t cover here and your home is literally full of ways for your budgies to murder themselves. Also, if your budgie was clipped and is learning to fly you can expect them to hit some walls, appliances, etc and generally end up in the worst places. Rest assured they will figure it out, and much like watching a child learn to walk, it will be extremely rewarding to see your clumsy baby grow into a competent flier. 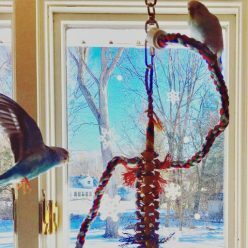 If you do your part and bird-proof your home, including windows and mirrors, you will be in a much better position to let your budgies fly safely and you won’t have to spend time regretting the “if onlys”. I’ve never owned a bird, thought I find them fascinating, and never would have thought about the mirror. We did have a songbird fly into our sliding glass door a few years back. Long story short, I spent 20 minutes calling bird rehabilitators to find someone to help (I thought she was extremely injured), only to drive a half hour to the woman’s house and for the bird to start waking up (she was just stunned I guess). By the time we got back home, she was about ready to fly inside my car. Whew! Thanks for spreading helpful tips to keep birds safe! Before I had good decal coverage one of my parakeets stunned herself similarly, they can sure look like goners! That was so good of you to find a rehab! I have found the birds outside still hit my windows sometimes when I put tape on them. I don’t have birds inside, though. Do you recommend clipping wings? I’m strongly against clipping except as a last resort. 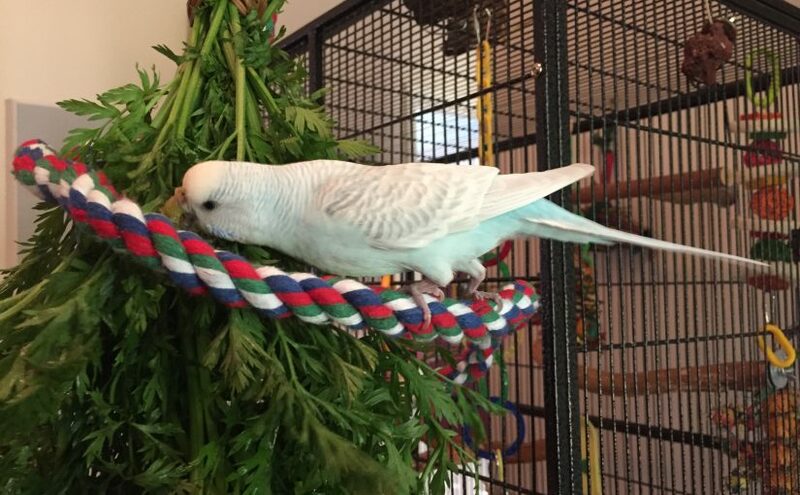 Flight is so very important to a parakeet’s physical and mental health. Not to mention the joy I get watching them soar around the house or having them come find me in a other room. I remember my mamaw had a cockatiel that was continously flying into a mirror to play with that bird. Mamaw started clipping wings before he had the chance to break his neck. As always a great post with sensible advice! Fun fact about blinds (the ones you use on the inside of the widow and are pulled up/down with cord): I have had generations of budiges now and they love them. Once they understand they are inanimate objects they hone in on the cord. Regardless if the blinds are up or down they will go for them, grab hold of them and then will try to chew through it. I tried everything I can think of to prevent this (pulling the blinds up to the very top, adding masking tape, duck-tape, introducing more “fun” “Toys”… reacting to them going for the blinds or ignoring them). I can’t keep the budgies away from the blinds. And they have “improved” plenty of them over the years. I know that look very well! Smart little stinkers. It’s hard not to laugh sometimes! I’ve never had birds before, so this didn’t even occur to me! You share some great tips on how to make your home a little safer. I love birds – my dogs are really prey driven so I cannot consider owning one but perhaps in the future. I have plenty of friends with beautiful canaries. I’ll share this post with them. I didn’t realize the mirror could be an issue so this is such a good technique to prevent injuries – the window kit is awesome too. I’ll share! Thanks for reading and commenting! Your clumsy fellow reminds me of our newest guy, Kevin. When he first started flying in the house he would literally hit the ceilings and the tops of the walls, while I’m like “how do you not see that, pal??”. I was also starting to wonder if he just wasn’t cut out for full flight, but he’s gotten a lot better, now I only sort of cringe when he’s at top speeds! Best of luck with your guy, I hope he starts learning some tricks from your flying ace!